Have you ever tried hand-pollinating your haworthias? It turned out to be easy, you should try it. You just need a couple of tweezers, a pad of paper, a pen and, if your eyes are bad, a magnifying visor. Maybe an audiobook. Like "I Contain Multitude". Or Cream's 1966 magnum, Fresh Cream. For the freaks who do not like Cream, I recommend Blink 182. 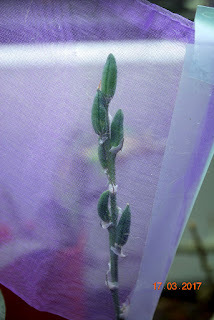 These seeds could soon become hybrid plants---Haworthia emelyae as female parent and Haworthia sylviae as male parent. Admit it, haworthia flowers are among the most boring inflorescence in the plant kingdom. Add to that, no bug in my yard ever figured out how to pollinate the fuckers and it's been almost five years since I started with this genus. So I normally just snip the stalks off when they grow long enough. I've always considered it a waste of energy that is better spent growing more leaves which is the reason for why I grow these plants. This one stands so fiercely on its own, flowers will just ruin the portrait. But sometimes, you do need seeds. 1. Quarantine: Select which haworthias you want to cross-pollinate. Once you have decided, it is important that you isolate these two plants, especially if you have other haworthias in bloom. The isolation will help ensure they wont cheat on you. Of course there is no way to tell whether or not a gnat beat you to it but you want to be at least reasonably sure that unsanctioned gene exchange will not happen when you're not looking. 2. Age the flowers; i.e. 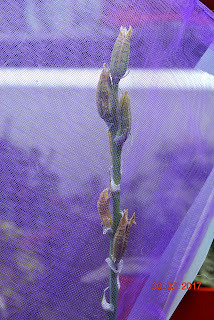 wait one full day after the flowers have opened before attempting to hand-pollinate. The pollen are immediately ready once the flower opens but the stigma will take a day or two to mature. 3. Strip the flowers. Once both male and female parent flowers are ready, both have to be emasculated to facilitate better access to the nether regions we are about to force-pair. It's a disturbing thought, if put that way, but it really isn't any better if a middle-bee or middle-moth was involved. Anyway, haworthia flowers typically grow in a spiral formation on the flower stalk. This will make it easier to poke and tug at it with one hand while supporting the stalk with the other. The first one that will open is your practice flower. Just rip it apart so you have a general idea of where everything is and how much contact with your metal tools these parts will tolerate before they are mangled to uselessness. First remove the lowest three petals by gripping the petal one at a time and pulling it gently downwards until it detaches. 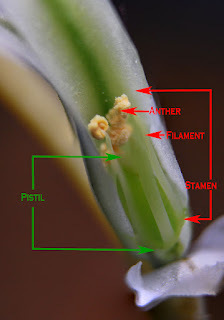 This will expose the stamen (the male bits) and the pistil (the female bits). You have to do this with both the male and female donor plants. 4. Remove the stamen from both plants. Once you remove the petals from both flowers, you can better see the stamens growing around the pistil. 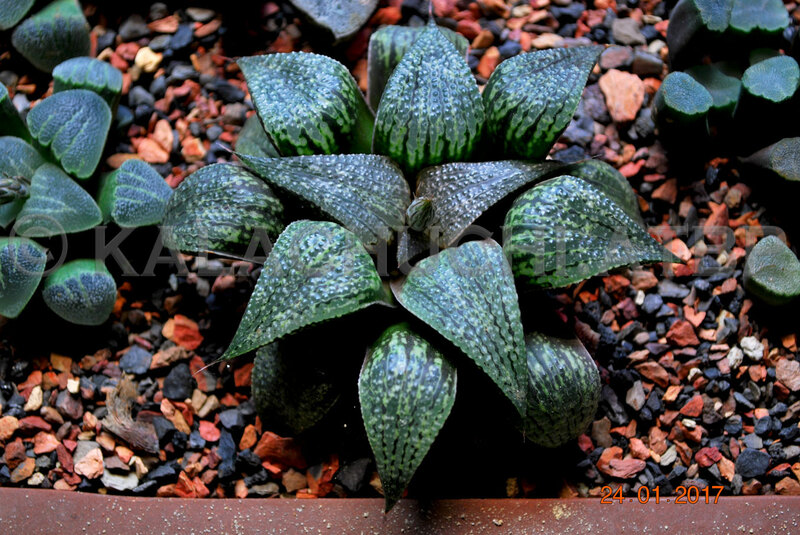 Typically, a haworthia flower will have 6 to 8 stamens. You have to remove all of them because they'll get in the way later. 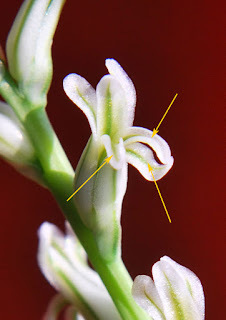 The easiest way to do this is to grab the stamen one at a time and removing them the same way you pulled the petals--downwards and off, if you are using a pair of tweezers. This is why the locking forceps are easier to use. Just grab the bottom of the stamen, lock the forceps and it will squish it with just enough pressure to snap it off. This will then expose the stigma--the female bit where you will apply the pollen later. The forceps will hold the stamen firmly in place, making it easier to apply the pollen to the stigma. 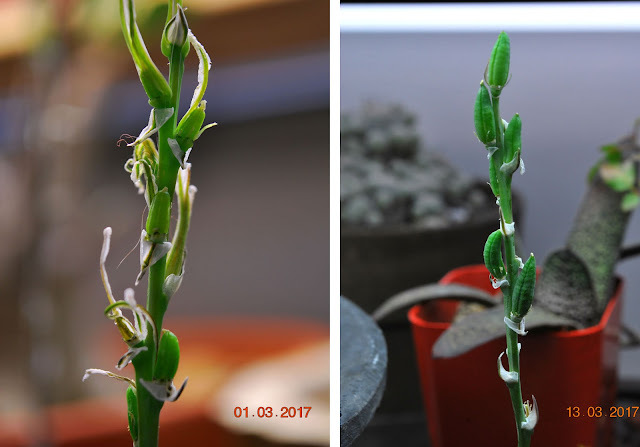 Because of the timing in which my haworthias bloomed and the flowers matured, I ended up with only two pollen sources (H. emelyae) and about six several H. sylviae stigmas ready for pollination. So, just yank all the stamen from one plant and put them on a sheet of paper. 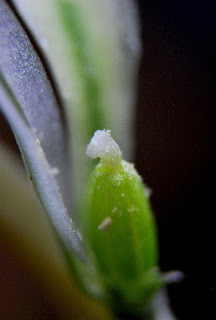 Then yank the stamen from the other plant and put them on a separate sheet of paper. Now is a good time to write down the name of the plants you are using. You will regret not taking notes at this stage because you'll probably end up going on a pollinating rampage and lose track of which was applied to what. 5. Apply pollen. Then, just start crossing the two plants, applying the pollen from one plant to the other and vice versa. Just rub the anther right against the stigma of the receiving plant. Touching the anther to the stigma is not enough, you have to get in there and scrape them against each other. And, you have to do this while also being careful not to destroy the stigma. If your eyes are as bad as mine, use a magnifying visor so you can see what you are doing. When you are done applying the pollen, label your stuff! It's easy to remember if you are dealing with only two plants. After a week, you'll be able to tell if all that was successful. Right: this is what they looked like after a week. About two weeks later, left photo. These seeds are growing on their H. emelyae var emelyae female with pollen from H. sylviae. The H. emelyae var emelyae flower took its sweetass time maturing so by the time all the H. sylviae flowers were ready, it only had two flowers old enough to receive pollen. So, we have two pods from it. This is a wispy bag Knitty Kitty sent to me so it was conveniently available. Most people use various forms of hosiery or gauze. The important thing is to wrap it in something that breathes. A plastic ziploc bag is probably not the way to go. 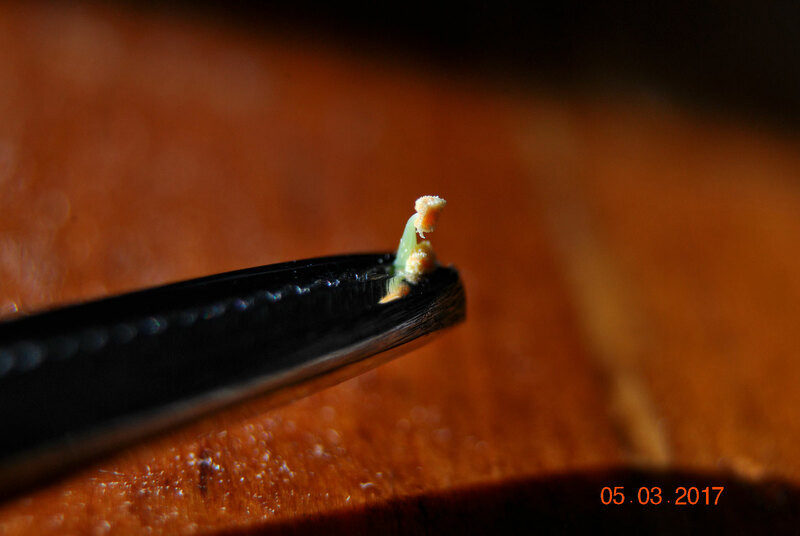 One of the most interesting techniques I've seen is the use of a drinking straw cut up into 1-cm lengths and then wedged over each pod. It will keep the pod from popping open fully and supposedly just open enough as it dries out, without spilling the seeds where you can't collect them. Some people use threads looped around the pod, also to keep it from popping open and throwing the seeds out. I can imagine how tricky it will be to tie threads around pods so tiny but it will let you color-code the pods and keep track of your crosses. Once you see the pods getting plump, it will take a couple more weeks for them to ripen. 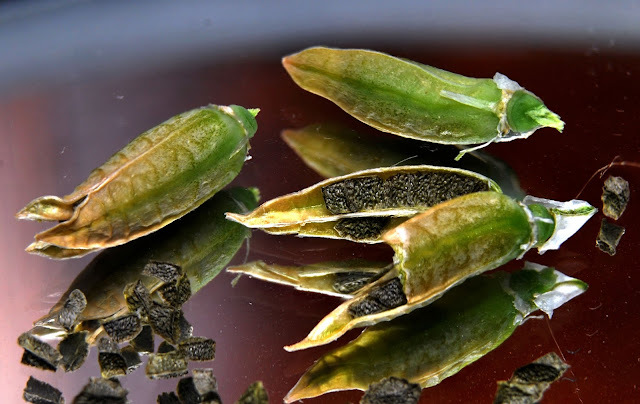 After that, keep an eye on the tips--they will snap open as the pod itself dries out with the seeds inside ready to be released. Fortunately, haworthia pods are not as explosive as adeniums. This kind of happens slowly, usually throughout the day. At this point, you can probably take the whole stalk and cut it off so you can store it somewhere more manageable. Fortunately, the seeds are not as jumpy as most succulent seeds. 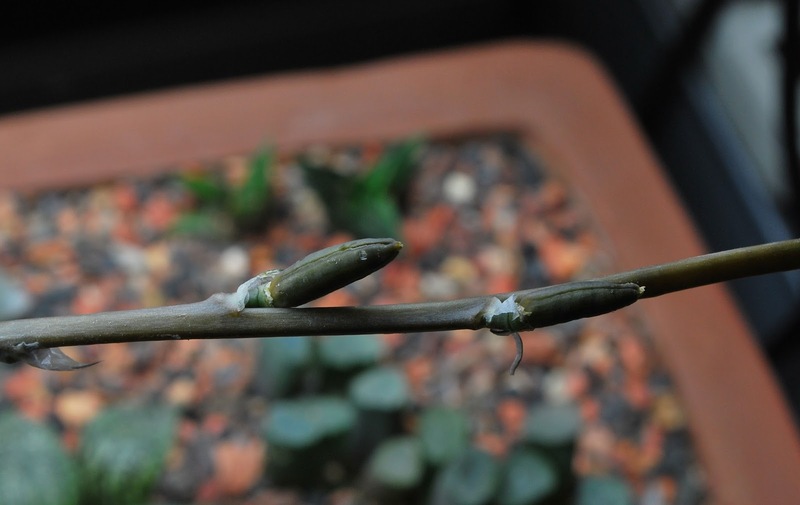 There were six pods in this particular stalk so when the youngest one started to open at the tips, even though it was still green and not as dry as the oldest one, I removed it from the plant. Seeds from the H. sylviae (F) and H. emelyae (M) cross. If you have questions, ask away, yo. 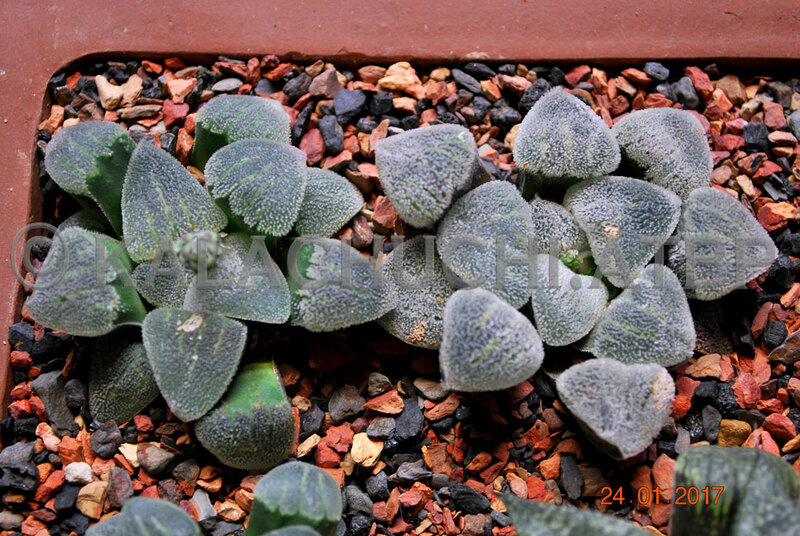 I have a question about haworthia being self sterile. Does this mean any clones/pups from the same plant cannot be used to fertilize flowers? The handful of haworthia I have seem to be on different blooming schedules, so I don't usually have two haworthia varieties in bloom at the same time. Right now my H. turgida v. suberecta is getting ready to bloom and has three pups that have flower stalks showing. I assume I can't use these to pollinate each other. Is that right? Thank you for the detailed guide. I'm hoping I will have a chance to use it someday. Pups are clones of the parent rosette so I'm afraid not; you need to have two genetically different plants. Timing really is one of the tricky things for me as well. Rarely do I get two plants blooming at the same time that I want to cross. Often I will have two plants that look too similar to bother with. If you check their typical locations in habitat, haworthias that look very different are often very far apart and so rarely exchange genetic material from cross pollination. It just means you need to get more haworthias.Ha! Hola, tengo una pregunta, si abren las flores como dijiste madura primero el polen luego abre el estigma, cuanto tiempo debo guardar ese polen en el sobre? 3 dias? permanece fresco? You can not store the pollen. 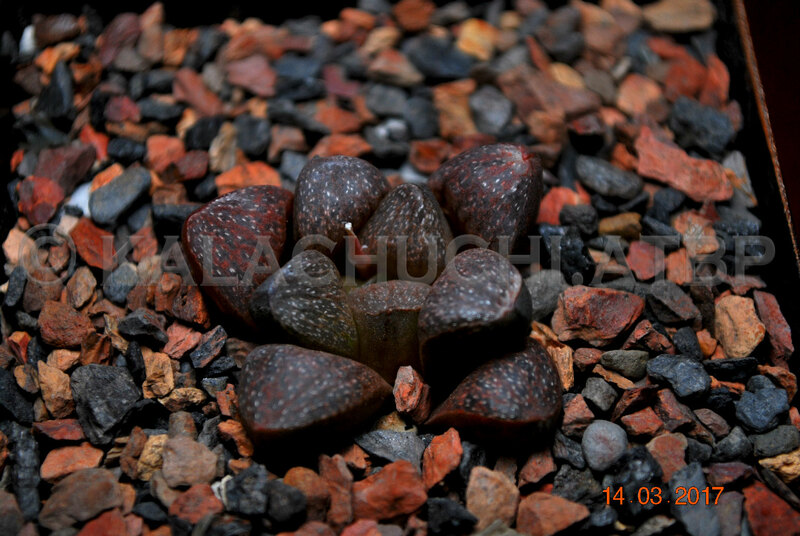 Once you have disassembled the flower as I described, you have to immediately apply it to the stigma of the flower on another haworthia. This is partly why hand-pollination often fail---it's hard to get the timing right. Sometimes, the pollen aren't mature enough, sometimes the pollen are ready but the stigma of the receiving plant need another day to mature.